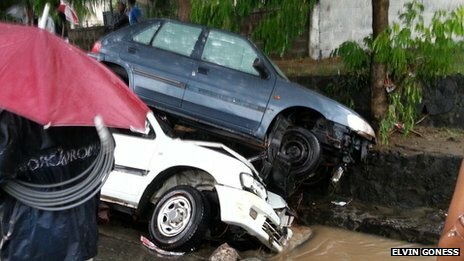 At least 10 people have died after sudden rains caused flooding in the Mauritian capital Port Louis on Saturday, officials have said. At least eight of the victims were caught in underground areas as the flood waters rose rapidly. Another died of a heart attack. The island’s metereologists said 152mm (6in) of rain fell in less than an hour, 70mm less than the March average. Prime Minister Navin Rangoolam declared 1 April a day of mourning. Speaking on national radio, he said Mauritius was suffering badly from the effects of climate change. The floods caused chaos in the city, with a huge traffic jam paralysing its centre, L’Express de Mauritius newspaper reported. A BBC reporter in the city says the bodies of six people were recovered from a pedestrian subway and another two from an underground car park. More rain is expected on Sunday, and people have been advised to stay at home.